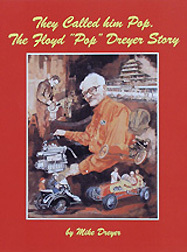 Out of his love for his grandfather, Mike Dreyer wrote this biography on Floyd "Pop" Dreyer. He researched to see if the stories about his grandfather were true or just exaggerations. He found out many stories were understated. Pop went from one of the nation's top motorcycle riders in the 1920s and some of his records still have not been broken; he then went on to be one of the leading race car builders from the 1930s into the 1950s and led the way in kit car building. Many of his racing innovations are still being used today. He was also a race car owner and his drivers won national championships. He had a "Whos Who" list of race car drivers driving for his team car. Later in life he became a successful businessman and was on the the first in the United States to sell Honda motorcycles. He was never satisfied with stock equipment so he custom built aerodynamic flairings for motorcycles and was the first to use fiberglass in building sidecars for motorcycles. Out of all his hardships of life, Floyd was able to overcome and triumph not only on the race track but in life. You will admire his spirit for life. This is one of the best books on the market.